look what I found this afternoon at Lowe's! the first batch of mums for the season. My big planter next to the garage door was really ready for a change. The verbena had stopped flowering and the rest looked so tired. (sort of like me by the end of the summer) So the geraniums will be transplanted into containers in the back, joining in with some of their friends . Wacky me, I decided to go with a varied look in this container. All my plants are looking tired from all the heat we had this summer. I started cutting a lot of our perennials back last week, much sooner then I normally would! 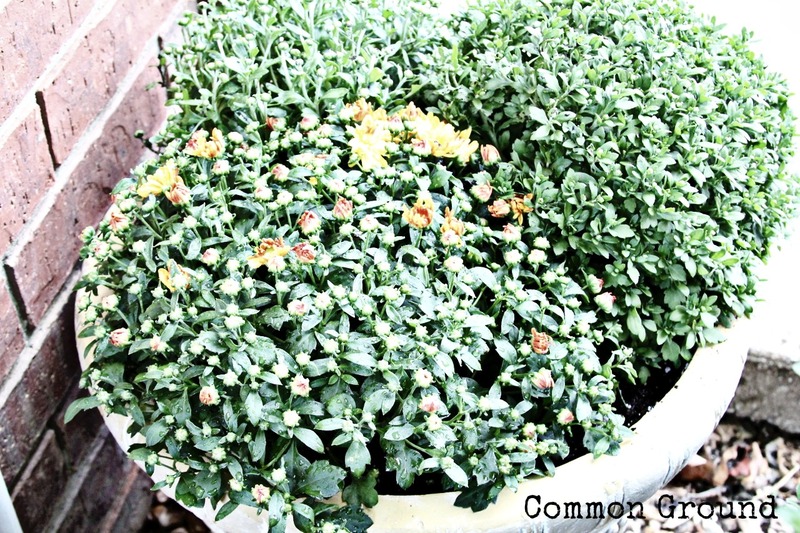 I love mums and yours look great in that planter! Debra, love these mums! I wish I could put some out now. Everything is starting to look a little stressed, at this point. It's still a little warm for mums, here; but I'm living vicariously through you! I noticed the large shipments of mums coming to town this past weekend. Such beautiful colors and they really have me dreaming of fall despite the high temps and smokey skies from all of the wildfires. Your pic is beautiful!! I can't wait to get my mums but it is too soon for NJ. They wouldn't last that long with the heat. Very fun! My Texas bluebonnets are at their peak here in Colorado, so I don't have the heart to replace them yet. Our cool mornings here are a sure sign that fall is on the way! So excited for Fall... love the mums. So pretty!I can't wait to get some too! It's still so hot in Georgia; I'm not sure they would make it. Lovely! 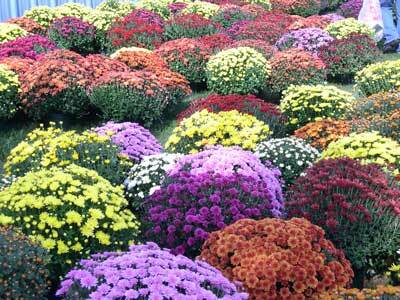 Such pretty mums and o many colors. I have one mum that has been throwing out flowers for awhile, but soon the real show will begin. Hoping that you have a good week. So happy to see more signs of fall. Got myself some orange ones yesterday! :D I just love the way they smell! :) Right on! oh yes! i cannot wait for the fall flowers! so tired of the hot days o' summer and ready for the coolness of fall. Beautiful, Debra...and I admit...I've put mums in already, too! Debra, Gorgeous mums! I love your big pot and your new flowers are perfect for fall. Thank you for always commenting on my blogs, it means a lot to me. Yeah!!! I, also, went to Lowe's looking for mums. None in yet! I came home with a new indoor plant instead. Told "Mr. Ed", " I need something green to view"!!! I'm done with brown! Thanks for showing your mums!!! I'll be watching closely for their arrival here on the Prairie! I'm not ready LOL! But LOVE the inspiration! i was just thinking about mums, and boy, do i need new flowers! I want to hang out one day in your garden and see all the beautiful flowers you grow. That would be super fun.